What could be better on a nice warm day than an Italian Ice? This is our newest flavor we created. Our family really loves making our own Italian Ice. We usually make it when we have some kind of fruit that we need to use up. This time it was a bag of frozen strawberries. We had the bag in the freezer for a while and just never felt like using it. 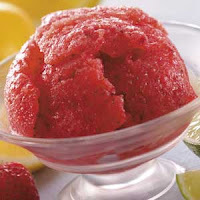 I asked the girls what they would like to make with the strawberries and they immediately wanted Italian Ice. While we were at the store we went to get the lemons and we saw some limes on sale. So that is how this flavor was thought up. We have a large family so this recipe makes a lot! You can make a half recipe if you do not want a lot. Mix the water and sugar in a pot and simmer. Add the strawberries and continue to simmer. When the strawberries have become soft use a potato masher to break them up and mix them in the liquid. Add the lemon and lime juice and boil for 2 minutes. Remove the pot from the burner and let cool. Pour the liquid into containers and freeze. This is a simple and very tasty treat on a nice warm day. Sounds great! Just in time for those warm spring days here in Arkansas, too. I’m shipping this one over to my wife (I’d burn water if I tried to boil it), so thanks for posting it! YUM! I did this with watermelon last summer and it was a winner. Enjoyed stopping by your blog! It’s definitely not ﻿uncommon to have dr﻿y Marches. The air is drier and more stable. The air masses ar﻿e not conducive to developing clouds and, e﻿v﻿entually, rain.